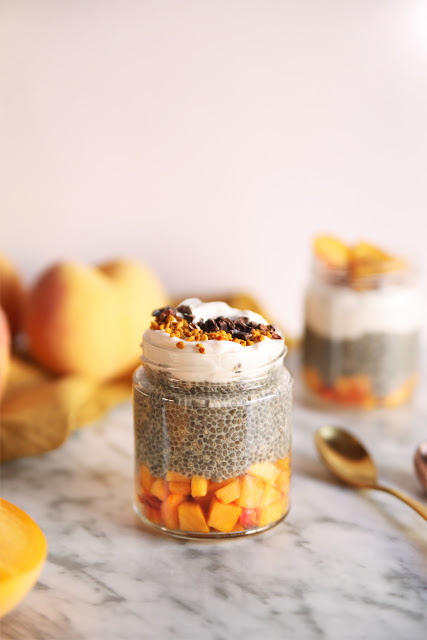 This month I haven't been very active on the blogsphere and it makes me feel somewhat angry cause I like to share new recipes every week BUT life happened...I had to do a million other things and I always end up having zero time for myself and the things that help me relax and unplug. I also celebrated my birthday last week and baked my own cake! Yep, I finally made up my mind and ended up buying tons of dark chocolate, lemons and maple syrup. 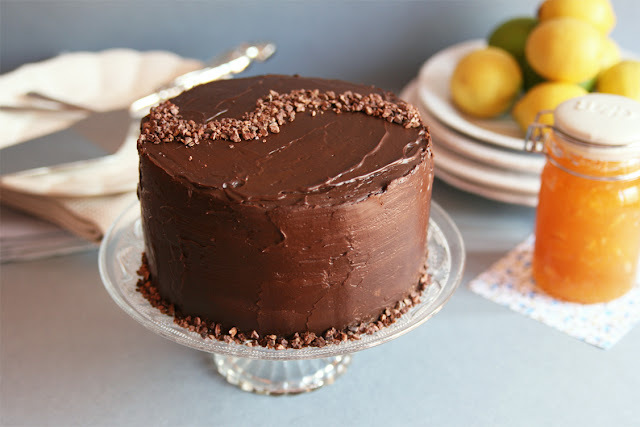 Lemon and chocolate is one of my favorite flavor combos in the world (right along with orange+chocolate) but it always has to be dark chocolate, the darker the better...well except for those 90% cocoa chocolate bars, but it also depends on the brand and the source. 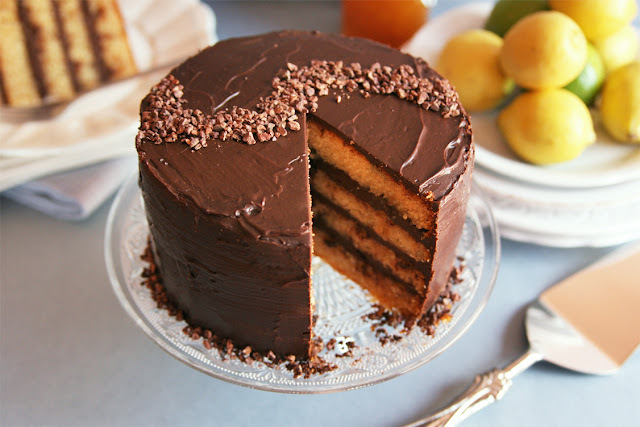 I've tried the lemon and chocolate combination before in cookies and other desserts but never actually made a cake with a super lemony sponge cake and a rich dark chocolate ganache, with a touch of lemon too! 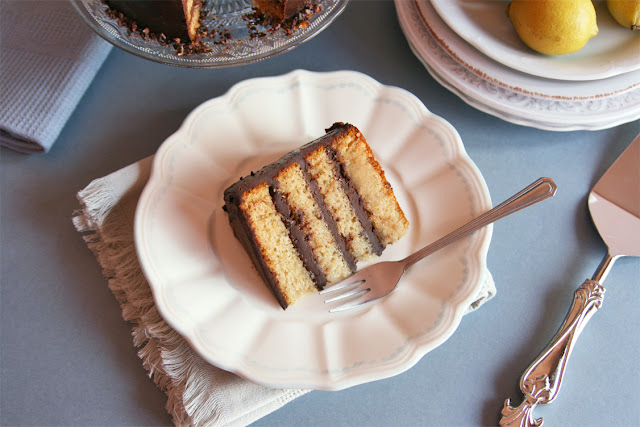 So I planned ahead in order to not stress during the week of my birthday and treated myself with one of the most delicious cakes I've ever baked (even my not-so-expressive and kinda skeptical-when it comes to new flavors-mom agreed!) oh and by the way, I also got myself a super awesome and big new food processor (eeek! ), check out my moment of happiness here. - Day One: bake the cakes, let them cool completely and refrigerate. 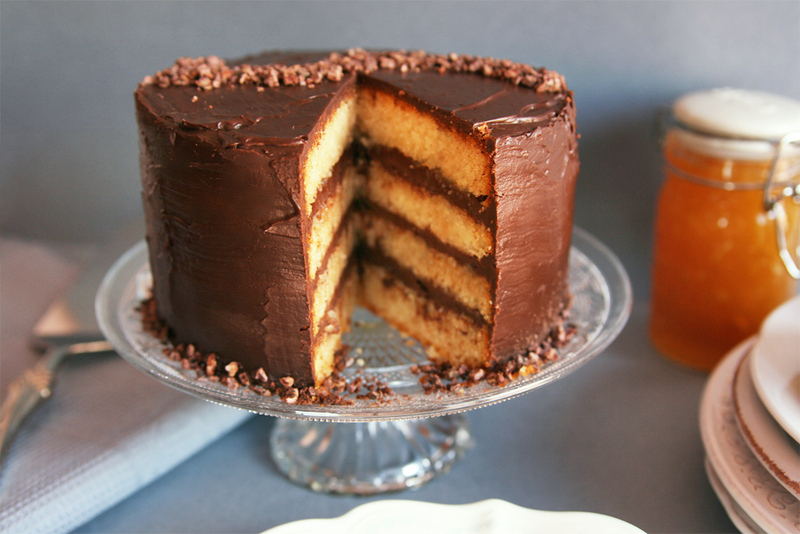 - Day Two: cut the cake layers and refrigerate again. This way they'll be firm enough to be handled with no problems so they won't break or crack. 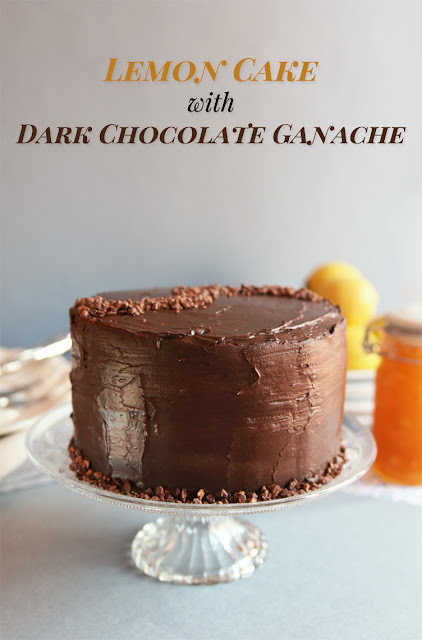 Make the ganache and assemble the cake. Hopefully I will come back next week with a new recipe right before September ends! 3 cups all purpose flour. 2 1/4 teaspoons baking powder. 1 cup plus 2 tablespoons pure maple syrup. 1/2 cup freshly squeezed lemon juice. 3 teaspoons apple cider vinegar. Dark chocolate ganache (see below). 340 g (12 ounces) dark chocolate (70% cocoa), chopped. 6 tablespoons pure maple syrup. 1 or 2 drops of lemon essential oil. Chopped cacao nibs, to decorate. Grease two 6 in x 4 in (15,2 cm x 10,2 cm) round cake pans and line the bottoms with parchment paper. Preheat oven to 350º F (180 ºC). In a large mixing bowl sift together flour, baking powder, soda and salt. 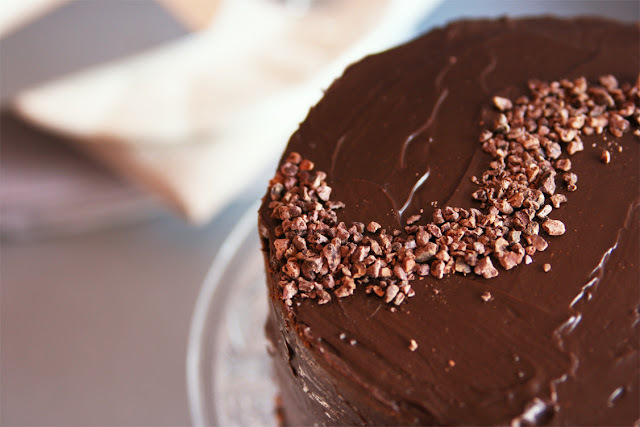 Stir well with a wire whisk to aerate the mixture and until all ingredients are well combined. In a separate mixing bowl whisk vigorously milk, maple syrup, sunflower oil, lemon juice and lemon zest, and apple cider vinegar. Add into the flour bowl and stir (using again with the wire whisk) until you get a smooth batter without lumps. It'll be rather thick so make sure there's no flour left unmixed at the bottom of the bowl. Divide the batter evenly between the two prepared pans (size of the pans are at the beginning of these directions) and bake for 45 to 50 minutes, or until a cake tester inserted in the center comes out clean. A few moist crumbs are okay. Once baked let the cakes cool in their pans on a wire rack for 5 minutes and then remove the pans and peel off the parchment paper. Let the cakes cool completely on the rack, top sides up. Refrigerate until ready to use, I recommend to let them in the fridge overnight. 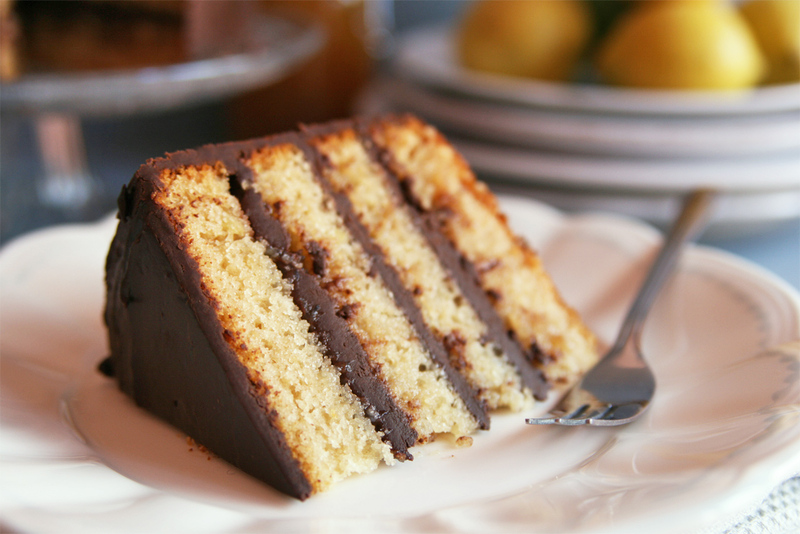 Cold, refrigerated cake layers are more firm and easier to handle, plus the assembling process is certainly faster. In a small saucepan bring the soy milk to a gentle boil. Remove from the heat and add in the dark chocolate, maple syrup and the drops of lemon essential oil. Stir well until smooth. Let it rest at room temperature until ready to use. 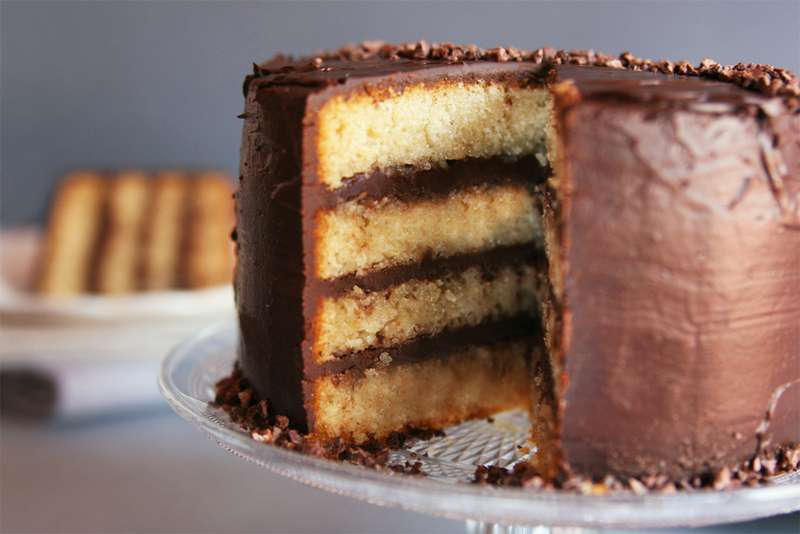 Cut each cake in half so you get four layers. 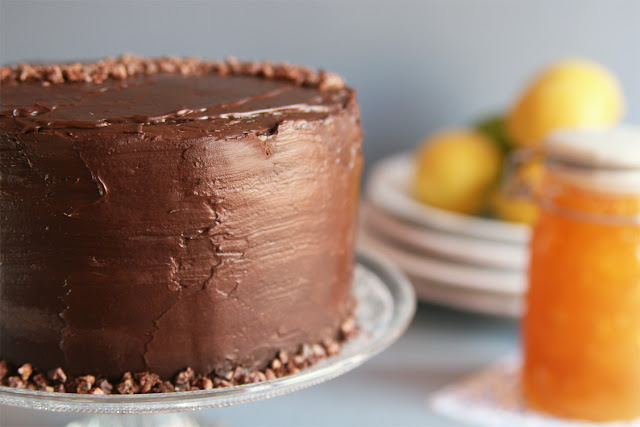 Spread around 2 tablespoons of lemon marmalade over each cake layer. Wait a couple minutes and spread 5 tablespoons of the dark chocolate ganache per layer. Coat the entire cake with a fine layer of ganache and refrigerate for 10 minutes. 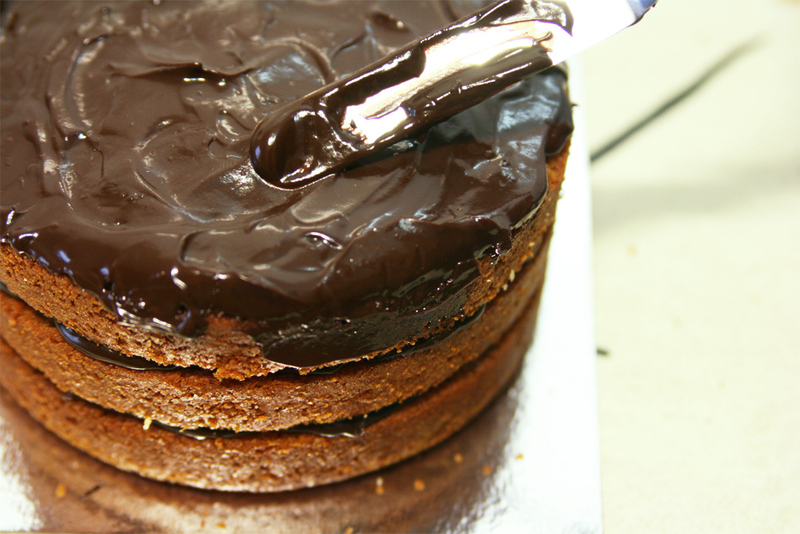 Finally glaze the cake with all the dark chocolate ganache. Sprinkle some cacao nibs on top and place back in the fridge until ready to serve. Hey Rebecca! Thank you so much for your nice comment. :-) I'm proud of this cake, it came out exactly how I wanted it to look. To be honest, I've had better birthdays...but owell, hopefully I'll have plenty more to celebrate. 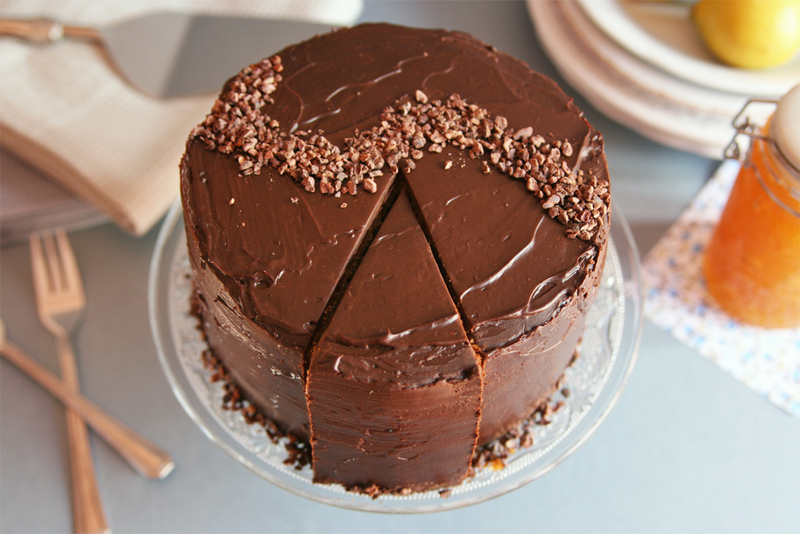 A slice of chocolate cake cures everything, though!